Vinex Soccer Table - Superia is made of quality laminated MDF board with Soccer & Football graphics printed on the side of table. It contains playing rods, made of hollow telescopic construction finished with chrome. 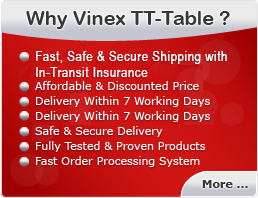 This table is especially designed to be used at Sports Clubs, Universities & Colleges, Corporate Offices and Home. It is the table game mostly played by all age of people. Scorer also comes with this table. It is designed with smoother finishing to prevent players from injuries and offers comfortable playing.